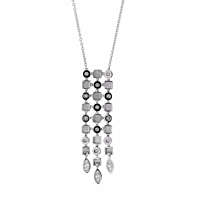 A stunning Lucea diamond white gold necklace from Bulgari. Designed to impress, this authentic Bulgari Lucea necklace is adorned with the finest Bulgari vs quality round brilliant cut diamonds set in 18k white gold. This necklace is perfect for those looking to make a statement or add some glamour to their wardrobe. This makes a perfect addition to any collection. Necklace Length Adjustable 14" - 17"